Okay, so what's at the intersection of Halloween and the act of reading and writing, we asked ourselves? Almost before we could finish forming the mental question, we happened upon this interesting little tidbit from the Brittanica.com blog. State-by-state, it lists midwestern libraries that, according to local folklore, have been haunted for one reason or another, including the 105-year-old Carnegie library in Ashtabula, pictured here. If you happen to live near one or more of them, perhaps you can check them out and report back to us on this crucial question. 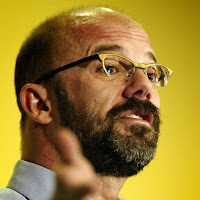 --from "Why I Blog," an absorbing essay in the current Atlantic magazine, by the writer Andrew Sullivan. --from a touching NPR on-air essay by 16-year-old Mia-Sarah Abedullah. You can read (or better yet, listen to) the entire thing here. Then, rather than feeling powerless about things, why not head over to the excellent investment advice site The Motley Fool, and graze among these good suggestions for how to react to the Panic of 2008. I especially liked the suggestion to ignore the TV circus barker/stock market commentator Jim Cramer, a Harvard graduate-turned-fixture of the idiot culture. We're hunkered down, armed with all the requisite elements for full hoops enjoyment mode. It helps that the weather has suddenly turned cold, so we have our heated blanket fired up. We've disconnected the home phone line so we won't be bothered by the usual annoying electioneering robo calls. We've got our assortment of favorite comfort foods arrayed nearby (don't ask), and we've just done a quick read of ESPN.com's NBA preview , in which columnist Bill Simmons, after drooling over a TV starlet, predicts the Cavs to win it all, and for Lebron to win the league's MVP trophy. If you lack the time or interest to read it all, here's the payoff passage: "We will see LeBron's first MVP season. Remember, the Cavs came within a couple of plays of toppling the Celtics last spring. They were damned close ... and that was without Daniel Gibson. Assuming they jump a level with Gibson, Williams and Whoever They Get For Wally, and assuming LeBron submits a career year (something like a 31-9-8), and assuming the media gets behind him (and not Chris Paul), LeBron will take the trophy home. He's due. We will see LeBron win the Finals MVP as well. My pick: Cleveland over New Orleans in the 2009 Finals. You will remember it as the first LeBron/CP3 Finals some day, a seminal moment in the league's history, the season when a new generation of stars symbolically moved the previous regime out of the way. The NBA...where rejuvenation happens." In the past, we've talked about great overlooked novels and also traded lists of books we're embarrased about not having read. Now, the Times of London invites readers to think about ten books they'd just as soon avoid reading. Amazon.com says readers have tagged these two works as "lousy books," and a book publishing veteran maintains in this article that lousy books are the result of soulless conglomerates having slowly taken over book publishing. There's even an official home on the web for Bad Books Month. But we also enjoyed how writer Joe Queenan had some fun here with the whole notion of bad books. And way back in 1946, the incomparable George Orwell set the bar high with this soaring ode to "good bad books," in which he observed: "Perhaps the supreme example of the 'good bad' book is Uncle Tom's Cabin. It is an unintentionally ludicrous book, full of preposterous melodramatic incidents; it is also deeply moving and essentially true; it is hard to say which quality outweighs the other." So we ask you, which books would make your lousy list? These two articles should serve as reminders that it's never too late to give writing a try. As the Cavs begin a new season, the advertisting industry's bible, Ad Age, takes a look at the progress Lebron, Inc. has made toward their previously stated goal of transforming their guy into a global sports icon, on the level already reached by Muhammed Ali, Michael Jordan and Tiger Woods. To review previous mentions of Lebron, go here, here, here, here, here and here. So which painful memory would you delete if you could? An old love, a stupid mistake, a thoughtless remark that ruined a friendship? Perhaps all of the above? We'd love to hear from you. --From the In a Word column in the current issue of The Atlantic, whose print and web versions have just received a major redesign. It's Sunday, so we don't want you to have to work too hard today. So rather than make you read, you can just look at images today. We've always gotten a kick out of the silly photos that routinely accompany stories about the stock market's gyrations on any particular day. You know the kind we mean--photos of people looking visibly worried or even shaken when the market plunges, and looking celebratory when it goes up. So we found this gallery of market-reaction photos by the German news mag Der Spiegel especially interesting. Meanwhile, to mark the magazine's 25th anniversary, Vanity Fair brings you their 25 top news photos. Meanwhile, here are a few videos that we've found interesting recently. Actor Matt Damon thinks the Sarah Palin candidacy "is like a bad Disney movie." You've no doubt heard and read about the infamous "Joe the Plumber," but may not have seen the original videotape of his encounter with Obama. One frustrated and articulate young Northeast Ohioan has a plan to secede from the rest of the state. And in our favorite video of the week (courtesy of our old JCUer friend Ann, whom we thank for flagging it for us), we're encouraged to consider who's acting like a...well, just watch it. We got wind of an unusual bipartisan method for blowing off steam from the tough election campaign, and decided to go have a look for ourselves. What we found--Obama and Palin going through a number of remarkably precise dance routines--took us by surprise. So we snapped this picture before the Secret Service hustled us away. --Ovid. You can learn more about the ancient Roman poet here. Have a splendid weekend, gentle readers. And may chance--or skill--bring the Cleveland Browns another victory on Sunday. --Matt Taibbi, writing in the current issue of Rolling Stone. He notes the central irony: that McCain has handed over his campaign strategy to the same slimy folks who only eight years ago slimed him out of the presidential race. Meanwhile, the New York Times takes note of the tarnished but still active Rove legacy. 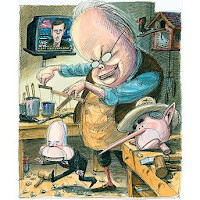 Steve Schmidt, the man who has been leading McCain's campaign into a ditch, is a one-time acolyte of Rove's (Schmidt & Rove absurdly argue he's not a Rove protege, but no one takes that seriously). Even more interesting is the godfather of it all, the first generation of Republican sleaze operatives: the late former Republican party chairman Lee Atwater, who spawned Rove. A devastating documentary of good ole boy Atwater's life is now playing at the Cedar-Lee, and I recommend you go see it. Its appearance on the scene, just a few weeks before the election, is a bit of exquisite timing. As long as you're at it, please consider reading this splendid, recently published Jeffrey Toobin New Yorker profile of Nixon dirty trickster Roger Stone, who also makes an appearance in the documentary. 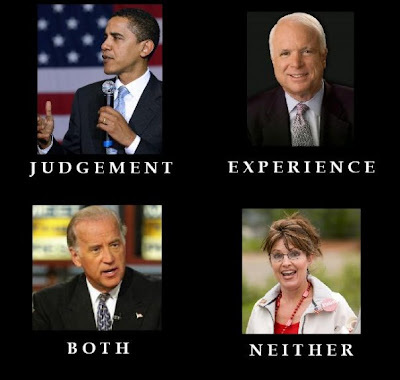 We hope you'll find all of this germane when you step into the voting booth next month. 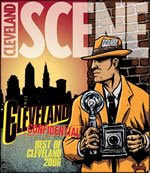 In this week's Cleveland Scene, the cover package looks at various hidden jewels of Cleveland. The paper asked a couple dozen writers and people about town to talk about their favorite hidden jewels of Cleveland. I contributed the following essay about my three favorite old Cleveland rooms. You can read the entire feature package here. When I think of lesser-known Cleveland gems, I come back to three awe-inspiring rooms, each of which serve as vivid reminders of the immense wealth this town once enjoyed. The three-story interior of the Huntington Building at the northeast corner of East 9th and Euclid was the world's largest when it was built in the early 1920s (the building itself was then the second-largest office building in the world). Even today, the immense scale of the place can blow you away. As you take in all of its architectural gigantism, you'd be forgiven for thinking you had somehow been momentarily transported to New York, London or some other international banking center. For me, the interior always brings home, in the most palpable way, how far the city has fallen in the decades since the booming 1920s. My personal favorite is the library of the Union Club, a study in Edwardian-era elegance, but with a touch of old-money restraint. I know many people avoid this building out of a reflexive and understandable revulsion for what it stands for. In fact, this very room once served as the segregated holding pen for the "ladies," the only such room in this once male-only club, which didn't admit women until 1982. Nevertheless, I suggest you somehow get past all that and just enjoy the place for what it is today--an exquisitely beautiful room that provides a visual feast. Whenever I find myself in the neighborhood, I make sure to budget an extra 10-15 minutes to just sit and admire the place. The English Oak Room, an art deco wonder in the bowels of the old Union Terminal complex, later to be called Terminal Tower (sorry, it'll never be Tower City for me), is the last of these vivid throwbacks to an earlier era. The stately dining room served the dwindling passenger train crowd, or at least the wealthiest slice of it, until it closed in 1975. It's since gotten a facelift and is available for special events. If you've never caught a glimpse of it, I suggest you do so (by appointment, of course). I liken these rooms to the still-graceful remnants of a proudly aging dowager princess. Or perhaps they're collectively the municipal equivalent of the faded move star Gloria Swanson in the movie Sunset Boulevard, decrying how she hadn't gotten small, only the "pictures" had. That former world, in which booming Cleveland was such a central hub, has vanished forever. But I still love revisiting it momentarily in the form of this trio of venerable rooms. With the right pair of lenses, faded beauty can be just as compelling as the other kind. My friend Roldo Bartimole discontinued his blog a couple of years ago, but these things live on forever on the Internet. And so I decided to have another look at it all. I found this small but pointed reminder especially worthy of being reprised. It's doubly germane these days, given the ever-winnowing number of fulltime professional reporters. --from an obituary in The Economist. The rest of it is pretty good also. You can review past best leads here and check out an earlier item on Newman here. --from Hill Country Harvest, a book published in 1967 by Hal Borland. A special thanks to the wry & learned bunch of creative rascals who pointed me to this timely bit of wisdom, the sublimely named Wooster, Ohio-based Monkey Mensch Gang. --from Wolcott's column in the November Vanity Fair. You can review earlier mentions of Wolcott here, and sample his blog here. (special thanks to our friend RTA for spotting it and sending it along). 'It's difficult to call yourself a poet. It's kind of like calling yourself a saint. You have to wait till thousands of people accuse you of being a poet." --Poet Billy Collins, interviewed today on the Diane Rehm show. You can learn more about him and sample from his poetry here. UPDATE: On his blog Writing for the Ear, my friend Mike Quinn posts the audio he originally captured of a presentation Collins made at John Carroll five years ago. We'd label this a must-listen. For many years, my friend Deanna Adams has organized a twice-annual writers conference at Lakeland Community College, picking up the torch from its founder, and her mentor, the late Lea Leaver Oldham. At this year's 25th annual event, held last month, Deanna marked the occasion with a touching tribute to all the things that helped make her the writer she is today. We thought it was a particularly moving evocation of the many sources of support, inspiration and encouragement that go into the formation of a writer, and so we bring you her entire presentation. If you enjoy this half as much as we did, we hope you'll consider stopping by her site and sending her some love. In September of 1983, I was a newly married 29-year-old (my own 25th anniversary had been two months ago), just beginning to realize my dreams of being a “real” writer. Ever since I was a kid, I had visions of sitting at the typewriter cranking out fascinating prose, writing dramatic stories, and imparting wonderful bits of wisdom. I wrote little plays and children’s books in elementary school. And dreadful poetry in my teenage angst years. And then, in my early 20s, decided I need some real guidance. So I enrolled here at Lakeland and signed up for a Creative Writing class and met my first mentor, Mr. Gene Dent. He taught in an interesting manner, and boy, he knew his stuff. He then encouraged me to take the journalism classes he was also teaching. So I did. Now, to back up a bit, I must confess - I was not a good student in high school. As a matter of fact, my mother often said I must really like my initials, DF, because she saw them so often on my report cards. That of course was partly due to my “rebel stage” but it was also because I never had a teacher who really encouraged me to do better. Most wrote me off as someone just getting by. Probably won’t amount to much. And I began to believe that. But then I took Journalism 101 with Mr. Dent. And that’s when my writing life changed. When he handed back that first assignment, I was thrilled to see I got a B- on it! But then there was a note at the bottom where he wrote “See me after class.” Oh-oh. (I wasn’t unfamiliar with that phrase). And this is what he told me. “You really have a way with words,” he said. “And I know you can do better than this. So I want you to do it over. I want you to polish up the lead. Give me a little more detail about the subject. And watch your run-on sentences (which, incidentally, I am still known for – and interestingly, many of the great contemporary writers do it all the time now, so it appears I was simply ahead of my time). Mr. Dent then told me he’d re-grade it. Wow. Here, I was really happy with the B-. But he thought I could do even better! And because of his faith and confidence in me, I wanted to prove him right. I did it over, paying attention to everything he’d told me. When he handed it back to me the second time, I saw a big red A. And in his class, and under his direction, I saw many A's after that. And while taking all the required courses for my Associates in Arts degree, I continued taking creative writing courses each and every semester. And of course, joined the staff on the Lakelander, the college newspaper. Soon Mr. Dent suggested I apply for an internship at the News-Herald. And that’s when I met my second mentor. Janet Podolak, who was then, and still is now, the best writer that paper has ever had. And I don’t care if someone tells that to Jim Collins . . . It’s true. As my editor, she took me under her wing, and while I first had to write up a lot of dry pieces like “Tip of the Hat,” the events calendar, and I think an obit or two, Janet began assigning me real features. And just about a month later—after telling her I was going on vacation—she told me to take notes, and photos, and I could write about my experience in a feature for the Sunday edition. Are you kidding me? I’d never written a travel piece, and with all those details and description you need . . . I didn’t think I could pull it off. But again, she thought I could. Soon as I got back, she and I worked on the piece together. I learned so much. And I tell you, seeing your words in a big Sunday feature on the front page of the travel section - or any section - is absolutely thrilling - and addicting. It had been a lot of work. But I couldn’t wait to do it again. And again. I stayed at the News-Herald writing pieces for free, long after the other interns had left. My first piece of advice to those of you just starting out: If someone gives you an opportunity to write for publication, even if it’s a church bulletin, do it! Don’t ask how much they’ll pay you. You’re getting paid in experience. And the more you do it, the more confident you’ll become, and the better writer you’ll be. And you’ll also, then, have writing clips to show future editors who will pay for your work. That internship was in 1981. In the winter of ’82, I met my third mentor, Lea Leever Oldham, the founder of this conference. Now she was a real pistol. I’d never met anyone like her before or since. She had the confidence, the wisdom, and the gumption (and dramatic flair) I could only dream of having. I took a couple of her classes, and one day, she came up to me at the end of one and said, “You’re coming to the writer’s conference I’m having, aren’t you?” Now anyone who knew Lea, knows that tone of voice she often used. It was not a question. I was going to the conference. I’m often told by aspiring writers how lucky I am to have had not one, but three mentors in my career. But this was no lucky accident of fate. I made myself be at the right place, at the right time, with the right people. You can’t meet mentors in any business without being where those mentors - those teachers – are. So go to where writers hang out. Be it in a classroom, an author reading, or coffee shop. I’ve also had aspiring writers say, “Well I love to write, but right now, I just can’t afford to take any writing courses, or go to a conference or workshop.” Believe me, I know where they’re coming from. As a young divorcee in my late 20s, I was working two jobs and still struggled to pay the rent, and all else that goes with making a living. But there are ways to get to where you want to be if you want it badly enough, you don’t have to have a lot of money to do it. But you do have to have determination, and you must be willing to sacrifice for it. I wanted to be a writer badly enough. So I decided I didn’t need a new blouse or earrings, and I could make do with those old shoes (just shine ’em up a bit), and bought a lot of generic products. And I saved up a couple dollars each week for the next class I wanted to take. And I practically lived at the library – after all, it’s FREE. I read all the kind of books that I wanted to write. And I studied them – paying attention to how they began, how the stories – Fiction or Nonfiction - connected, how they were organized chapter by chapter. And I read - and studied - tons of books on writing. I took out all the writing magazines available – like those out there on the conference table. (Which, today, is also Free). And I went to that conference – Lea Oldham’s First Western Reserve Writers Conference, 1983. And I went to nearly every one after that. Including the Spring ones, which she began later. This leads to my second piece of advice. Invest in yourself. No one cares more about your future than you do. No one cares more about you becoming a writer than you do. No one will help you become a good writer more than those who have been there, right where you sit today. But you have to be Determined. You have to Sacrifice. And You have to Get A Little Help From Your Writer Friends . . . If you don’t have any writer friends, it’s because you haven’t yet been to a writing class, a writers’ conference, or a local book signing. You haven’t been to where writers - and their mentors - hang out. But you are today. So I know every one of you has that determination. And probably more than a few of you had to sacrifice a bit to be here today. Be it by saving up a little money, or getting your husband, mother, sister or brother to watch your kids. (Been There!) But trust me on this: By the end of today - The First Day of the Rest of Your Writing Life as you rejoin me in this room for refreshments and the Q and A Panel, you will agree with me that it has been worth every penny, and a few sacrifices. And that this is still the best deal for writers in town – or probably anywhere. Because thanks to the founder of this conference, who knew what it’s really like to be a writer, you will gain concrete and useful information, insight, inspiration, and yes, a new writer friend or two. Along the way to my writing life, I worked hard at developing my skills, and soaking up as much information as possible, so I could be a GOOD Writer (as opposed to Being a BAD writer, and believe me, just because you are published, doesn’t always mean you’re good), and so I made sure I learned from the best. I accumulated Literary Heroes. Great writers who, by merely reading their work, I learned so much from. Like William Zinseer. And Mary Karr. And David Sedaris. Frank McCourt. Anne Lamott. Susan Issaacs. And Elizabeth Berg. Even old guys like Ernest Hemingway and F. Scott Fitzgerald, E. B. White, and Sherwood Anderson. And of course literary women of long ago: Willa Cather, and Flannery O’Connor, Katherine Mansfield. I know a few on that list, some of you may never have heard of. You see, not all the well known “great” writers have done it for me. Their work didn’t touch my soul, for whatever reason. You have to read a lot to acquire your own personal literary heroes, and they don’t have to always be the best sellers. This is just MY list – You go get your own. And there is also My Local Literary Heroes List - and that keeps getting longer and longer - which gives you an idea how lucky we are to be living in the Greater Cleveland area, where I swear there must be something in the water when it comes to the Arts – any of the Arts. To add to my Literary Heroes, I don’t have to go any further than my own hometown. There is Connie Schultz and Regina Brett, and Joanna Connors – all in one newspaper! There is Michael Ruhlman, and Sarah Willis, and Les Roberts. There is Michael Salinger, and Erin O’Brien, and Michael Heaton and Scott Lax. There is John Ettorre and Ray McNiece, and of course my old mentor, Janet Podolak. I am so proud to call each and every one of these talented writers who produce such great work in Northeast Ohio, my friend. And whenever I happened to be mentioned in the same breath as them (ok, not all that often, but it has happened!) I feel so honored, and so humbled. And it makes me want to work hard enough to have actually earned that mention. And that’s why we need a Little Help from Our Writer Friends. They help us aspire to be like them. To strive to write even better than them. So there’s a chance that someday, we can be mentioned in the same breath as them. And be as supportive of them as they are to us. Because they are actually willing to help us by teaching us. Or merely by taking the time to talk to us at their book signings, about how they do it. We need these writer friends. We need them when we, finally, get our work published. We need them when we receive that 100th rejection letter. We need them in the beginning of our career. And in the middle of our writing trenches. And certainly at the end, when we’ve completed that long project of writing a book and are, finally, the ones sitting at that book signing – praying someone will buy our book, or at least not ask us where the latest Stephen King novel is – Because they think we work there (oh, yeah, ask any author, it happens!). 1) Don’t FIND time to write – because you never will. You have to MAKE the time to write. A) Taking Classes, workshops, and conferences such as these. B) Learn by doing. Sit in that chair and write as if your life depends on it. You’ll be amazed what comes through if you just sit and write and write, and keep at it. C) READ. READ. READ. Not just for pleasure, but to see how it’s done! Stephen King said it best: If you don’t have the time to read, you don’t have the time or the tools to write.” Those are key words – TIME. TOOLS. The Tools are seeing how the writer makes sense of it all. How the prose comes together. How it all WORKS. 3) Support other writers – After all we’re in this together. Go to their book signings, attend their workshops. Go see them when they give a Presentation. Ask them questions. Tell others about them and their work. Read a Good Local Book Lately? – SPREAD THE WORD! 4) And finally, make writer friends. This is why, as of today, I’m reintroducing something that my mentor, Lea, always did at her conferences. These little stickers to put on your name tags – Yellow for Fiction, Pink for Nonfiction, Green for Poetry and Children’s Writing? This way you can see immediately what those next to you are writing. Seek out those whose writing interests are similar to yours. Talk to them, discuss your craft, commiserate over your rejection letters (and I believe you’re not a real writer until you’ve received your share of them b/c that means you’re at least sending your stuff out). Exchange emails with them, meet them at coffee houses. Form your own writers group. Because we need each other. We are each other’s mentors, co-conspirators, and yes, friends. Because those other people out there? The NON-writers? They don’t have a clue what we writers have to endure. The Blood, Sweat, and Tears. And Fears – oh, most certainly that! Those ones, the ones who aren’t writers? They think we do it because “We like to write” and “It’s such a nice “Hobby” and “You’re so lucky to be able to just sit at home and write in your pajamas . . .” They just don’t get it. We don’t do it because we like it or merely because we want to – though there is that. We real writers do it because we have to. We really have no choice. And only you, the real writers here, know just what I’m talking about. So Folks, Here’s to another 25 years of Learning How to Do It. Wired Mag nabs it with "The Seven Habits of Highly Ineffective Terrorists." You can review earlier FHOTWs here. If you're a Northeast Ohioan, I hope you'll consider taking in at least part of the COSE small business conference in three weeks. By all accounts, it gets bigger and better each year. This year, I'll be on a panel talking about blogging and Web 2.0, and how people in business and the arts can better harness the tools to connect to more and better opportunities. But I'll let my friend Roxanne, who I mentioned briefly last year, tell you first-hand about its benefits. In this brief video, she talks about the energy boost she got from attending last year's conference. Hope to see some of you there. Meanwhile, we'll be silent over the weekend, while we're taking part in the weekend writing retreat in Lakeside, Ohio. If anyone wants to join us for a last-minute Saturday-only portion, just buzz me at john.ettorre@gmail.com, and we'll be glad to accomodate you. Talk to you again on Monday. Enjoy your weekend, everyone. Veteran novelist Francine Prose doesn't think so, even though she's taught creative writing off and on for two decades. On the other hand, she tells the Washington Post, "'reading can for sure be taught,' she says. And in her view, close reading, combined with constant writing, is the only way a writer really learns." We'd second that opinion. How about you?